This mutli-media filter utilizes both KDF-55 and granular activated carbon to substantially reduce chlorine, bad tastes and odors, as well as a wide variety of heavy metals (including copper, iron, and lead). It has a nominal filtration rating of 5 microns and should be replaced every 6-12 months under normal residential use. It features a greater volume of KDF-55 media that most competitor's filters, and a longer life than most carbon filters of similar size. This filter was previously manufactured and marketed under the Sta-Rite brand name. Max 125 psi. 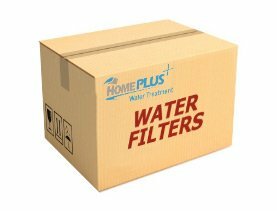 A popular filter for all-round residential water filtration. Can be used in most point-of-use water filter systems and as a pre-filter in many reverse osmsois systems. Dimensions: 3" x 9 3/4"